The cornerstone of any at home dental care plan is the classic toothbrush, toothpaste, and dental floss. However, oral care products are a 40 Billion dollar industry and many of them may be able to improve your routine at home. From water flossers that are more effective than dental floss to stylish mouthwash to spice up your bathroom sink, these are dental products you’ll be proud to have in your oral care collection. A lot of people claim they floss, but actually aren’t fans of the process – at least in the traditional sense. For those who hate using dental floss, water flossers can be the answer to your flossing needs. Many brands have various types of flossers for those who want one that’s affordable or loaded with cutting edge features. Consider these options when you want to clean your teeth with water pressure rather than a strand of floss. For an innovative option that doesn’t require cords or batteries, the Profloss Waterflosser doesn’t even need a water reservoir – it gets its power and water from the faucet in your bathroom sink. With a sleek, grey and white look, the Profloss Waterflosser also takes up minimal space on your countertop. Purchase it at the highly affordable price point of $24.99. From disposable flossers to toothpicks, there are a wide variety of ways to clean your teeth on the run. These products are highly affordable and available in many locations, and using them is just a matter of developing the habit. The ability to clean your teeth in your car, during a quick bathroom break, or before an important meeting is the main advantage of portable dental cleaners. As one of the classiest toothpicks around, these won’t only come in a fancy case that’s adorned with the Daneson logo but they’re infused with the flavor of scotch. While the most popular flavors often found in toothpicks are mint and cinnamon, the taste of scotch will truly be a surprise to all who try them. Know someone who appreciates a glass of scotch once in a while? You can send them this impressive gift set for just $35.95. There are many types of mouthwash out there and each one can accomplish different things for your mouth, health, and breath. For example, some brands only freshen your breath without killing germs or providing a whitening effect. 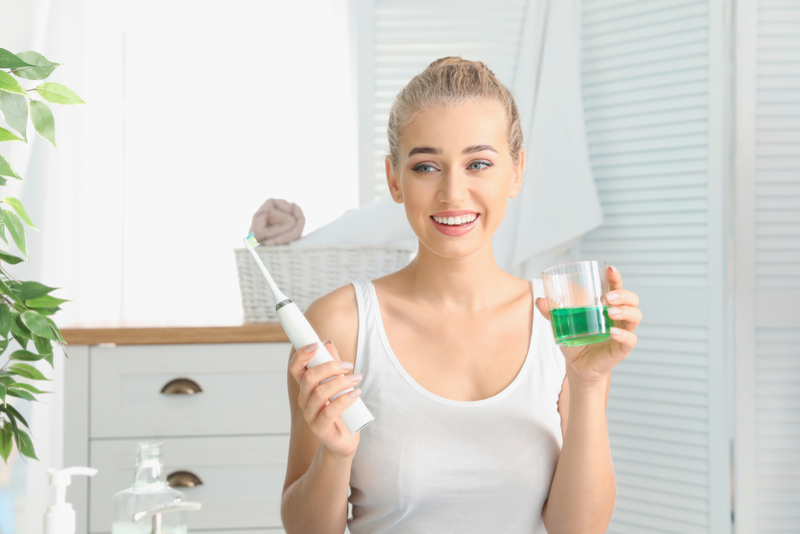 When looking for the best mouthwash to compliment your oral care routine, it’s best to first consider the main reason you’ll be needing it in the first place. Highly recommended by doctors, the Cool Splash Mouthwash by ACT has made its way to the top of many review lists, and for good reason. Featuring the ability to restore minerals and strengthen enamel, the Cool Mint taste is just a bonus. Killing germs and the bacteria that cause gingivitis are valuable advantages that will help your smile remain fresh for the long haul. If you want to set yourself up with mouthwash for awhile, you can find a pack of four bottles for around $25.00. While you can clean your teeth perfectly with a standard toothbrush, a high-quality electric toothbrush can greatly reduce the strain on your wrist and dexterity required to thoroughly brush your teeth. But they offer other advantages as well. Often measured in how many tens of thousands of rotations per minute, electric brushes can offer a quick and powerful cleaning experience that you can’t find elsewhere. The number one recommended electric toothbrush by doctors, the Sonic FlexCare+ runs at a remarkable 31,000 rotations per minute. On a full charge, you can expect the Sonic FlexCare+ to stay powered for up to three weeks. With five distinct brushing modes, everyone will find a setting they love with this highly-acclaimed electric toothbrush. You can upgrade your brushing routine with this popular high-powered toothbrush today for just $94.99. Regardless of how impeccable your oral care habit is at home, accidents happen, and sometimes they can cost you a tooth. While other factors may also result in tooth loss, one thing is for certain: You’re going to want to replace it as soon as possible before other teeth change position. Dental implants are the optimal way to do that, and you can get them by scheduling a consultation with an implant specialist like Dr. Darlene Hart from Pembroke Pines, Florida. While the products you buy at the drug store can be excellent for improving your oral health, they can’t diagnose or treat sleep apnea. As a debilitating sleeping disorder, sleep apnea starts by causing the sufferer to wake up dozens of times throughout the night. This can lead to serious problems for the heart and other parts of your body. Ensure your snoring isn’t the sign of something bigger by visiting a sleep specialist like Dr. Jennifer Buchanan in San Rafael, California. A mouth full of crooked teeth is a condition that’s rarely your fault, but nonetheless, it takes its toll on your appearance and ability to bite. The most popular treatment for realigning your smile is Invisalign, a system of clear aligners perfectly customized to your teeth. While it’s not ideal for everybody, Invisalign can be the answer for those who’s misaligned teeth are in the front. Learn more by visiting an experienced orthodontist like Dr. Stephen Grussmark in Miami, FL. Is it Time to Upgrade Your Oral Care Routine? Yes, it’s true that a simple toothbrush and strand of floss is all you really need to maintain a clean, fresh smile. However, if new and innovative products can improve the fun or effectiveness of the process, or even make you look forward to your brushing sessions a little bit more, then they definitely are worth the investment.